Obituary – Megenity, Ethel L. (McCormick) « Perry High School Alumni Association, Inc.
Mrs. Jack (Ethel L.) Megenity, 78, Red Rock, died at 3:30 a.m. Sunday at St. Joseph Medical center at Ponca City where she had been a patient since June 1. Funeral will be at 10 a.m. Tuesday at Parker Funeral home with Rev. Robert S. Bazzell, pastor of the Ceres Baptist church, officiating. Burial will be at Grace Hill cemetery. Casket bearers will be Derrell Sullins, Bertsel Ratliff, Ed Nemechek, H. A. Linn, Jess Osborne and Floyd Holland. Memorial contributions may be made to the Oklahoma Medical Research Foundation for heart research. Mrs. Megenity was born Aug. 21, 1899, at Mulhall. She had lived in the Mulhall, Perry and Red Rock communities all of her life. She was a 1920 graduate of Perry high school. 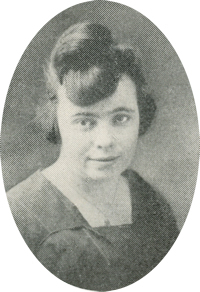 She and Jack Megenity were married Aug. 29, 1926, at Perry. Mrs. Megenity was a member of the Ceres Baptist church and was a charter member and past worthy matron of the Red Rock chapter of the Order of the Eastern Star. She had been in ill health one and one-half years. In addition to her husband, Jack, of the home address, survivors include a son, J. A. Megenity, Red Rock; a sister, Mrs. Louise Green, Perry; two brothers, Myrl McCormick, Perry; and Byron McCormick, Arkansas City, Kan.; a granddaughter, Mrs. Karen Tautfest, Enid; a grandson, Dale Megenity, Red Rock; and two great-grandchildren, James and Jeremy Tautfest, Enid. Mrs. Megenity was preceded in death by one brother.